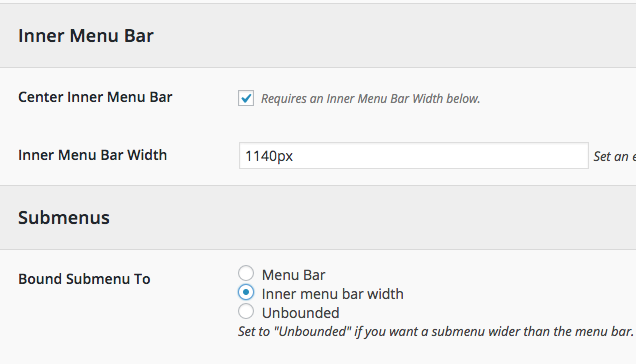 To replace Listify’s secondary menu with UberMenu, you’ll want to use Manual Integration. Note that as Listify has multiple menus, and the primary menu’s mobile menu is wrapped inside the secondary menu’s container and combined together on mobile, it makes integration more complex. First, copy your header.php into a child theme to preserve these changes if you update the theme in the future. The primary menu cannot be replaced easily by UberMenu, because the theme adds special items to it like the user name and avatar, etc. However, this menu is hidden by the theme on mobile, and its replacement is combined with the secondary menu, which makes things complicated. We’ll replace the entire #site-navigation nav block with the UberMenu manual integration code in the header.php plus the theme’s responsive primary menu, as shown in the PHP below (see Before and After). Otherwise, the primary menu won’t be displayed at all on mobile. You’ll also want to center the inner menu bar for this configuration and set the inner width to 1140px, as well as bound the submenus to the inner menu bar.